For our last project visit of our Colorado trip, the GLCM program visited the VA Hospital project in Aurora, Colorado just outside of Denver. The scale of the project sites we toured throughout the week steadily increased, concluding with the VA Hospital run by a joint venture of Kiewit-Turner. Turner staff Dave Duffy, Project Executive, Laura Plendergast, Project Manager, Art Littman, Senior Engineering Manager and Jim Johnson, Project Engineer were kind enough to guide us through our tour of the massive 31-acre site. Just the figures behind this endeavor are incredible. 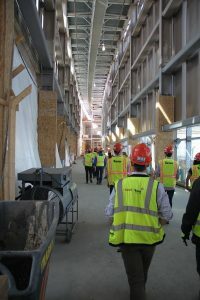 Kiewit-Turner’s staff to manage the construction currently number over 150 people and peak craft labor on site was over 1,000, with current labor force on site at around 700 workers. 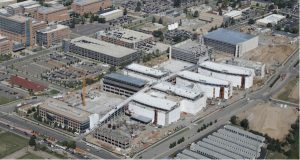 The U.S. Department of Veterans Affairs hired a joint venture design firm of Skidmore, Owings, and Merrill and H+L Architecture to design a replacement for the overfilled and aging Denver VA Hospital, which Kiewit-Turner has been constructing for about 4 years. During our visit we were fortunate enough to receive a first-hand account of the ongoing saga of Kiewit-Turner’s efforts to construct the VA Hospital for the VA that has been widely reported in the press. When the design was 50% complete, the VA hired Kiewit-Turner to provide pre-construction services and then construct the building themselves. The VA set a budget limit of $582 million for the facility. However when reviewing the design the construction team believed it would cost substantially more than that to construct, up to $664 million. With construction in progress, the construction team offered numerous suggestions on how to alter the design to cut costs, totaling over $140 million. These changes were in the end not accepted by the design team and the VA, with the design spiraling into even higher costs to build. At this point the construction team consulted with each respective company’s legal departments and informed the government that they would be bringing a lawsuit against them for breach of contract to provide a design that is able to be constructed for the agreed upon cost and that work would be halted until the VA could reduce costs or provide Kiewit-Turner with proper compensation. Kiewit-Turner won this lawsuit and stopped work immediately in December. By the next week the VA provided the construction team with $150 million in back charges and work was resumed on an interim basis on cost-reimbursable contract that is still in place pending a new deal. The project currently has an estimated cost of $1.7 billion and a projected finish date in 2017. Through our tour we were shown valuable examples of possible value engineering that could have been implemented had the construction team been integrated into the project team earlier in the process. This spanned items such as exterior finishes installed in spaces not seen by the public, oversized ceiling heights, and doors not sized correctly to the mechanical equipment within. It was an invaluable learning experience to see real world examples of how important it is to have the construction team integrated into the project as early as possible on large, complicated projects. It was stressed how details are potentially much harder to correct the later the construction team is brought into a project, like we have been taught in class many times. While the story of the process behind constructing the project was hugely educational and incredibly fascinating, the scale of the medical facilities themselves were nothing but impressive. The new campus includes 12 new structures that total 1.1 million square feet of occupied space and 1.2 million square feet of parking. 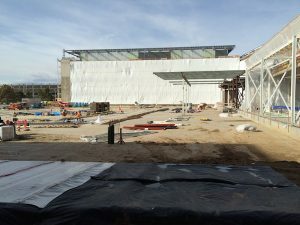 The centerpiece of the design is a 1,500 foot long, 70 foot tall glass and steel atrium that connects all of the medical buildings. This atrium itself is 40,000 square feet and costs $115 million. The campus includes three outpatient clinic buildings, two inpatient facilities, a diagnostic and treatment center and three parking garages. Some of the key features of these structures include a spinal cord injury clinic, a floor dedicated to mental health care, therapy pools and research labs. The buildings also includes an enormous water storage tank and other sanitary facilities so that the building can sustain itself during a major event where outside plumbing is unavailable. The project’s mechanical spaces include a huge amount of piping, generators, compressors and other equipment. 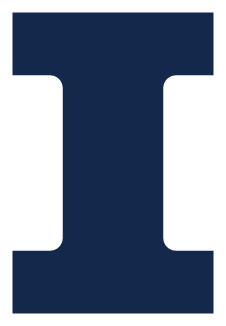 An interesting note was that many systems were located in one building but shared between the entire campus, such as the electrical distribution system. During our tour we saw many unique aspects of this type of construction. One example is that between floors in the clinic buildings there is an “interstitial” floor. This floor is a separate slab above the ceiling of the floor below that houses all of the overhead mechanical ducts and piping, in order to provide easier maintenance. The project team also noted that the mental health facilities had to be built in such a way that nothing could be taken apart and potentially be used for harmful purposes. 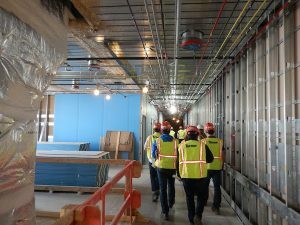 During the tour we also learned that surprisingly the VA or any federal project is not required to follow any local building codes, but have their own set of standards for building construction to follow. The project is also pursuing LEED Silver certification and includes green features such as photovoltaic panels for turning sunlight into electricity and as using as much natural light as possible. The project was a fascinating learning experience for both the business side and the engineering design side of a massive project. As many of the GLCM students head off to ski in the Colorado mountains, we would like to thank all of the companies who hosted us and gave us a look into some incredible projects during our visit and all who made it run so smoothly.